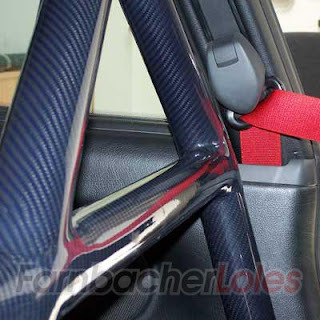 I was looking at Bens blog and noticed a post on Carbon Fiber Roll Cages. Interesting. I had to investigate it a little more. They only have applications for 996 and 997's and I am sure they are expensive, but very interesting. The more carbon fiber, the better. Oakley Design even lists titanium body 4 way adjustable suspension. Very cool for the uber carbon fiber and titanium nerd I am .